What are the benefits of sharing in open-source agriculture? 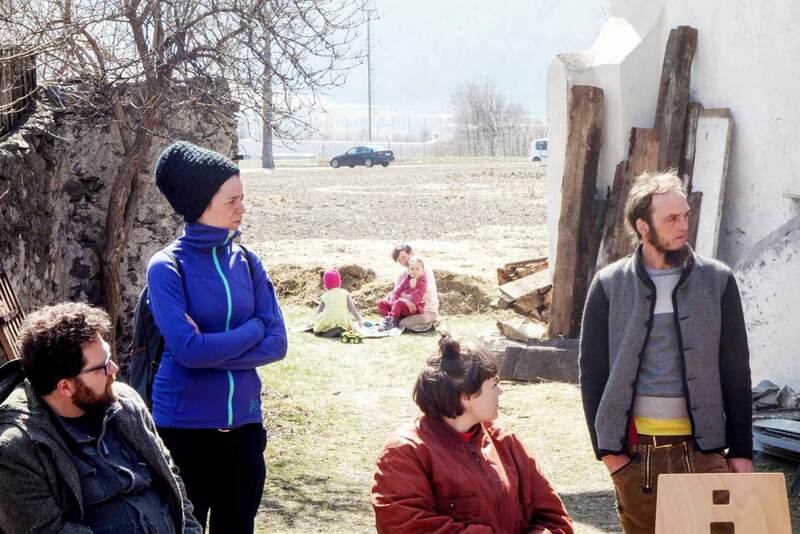 What is being shared and what farming communities need to share in the future in Alto Adige – Südtirol? 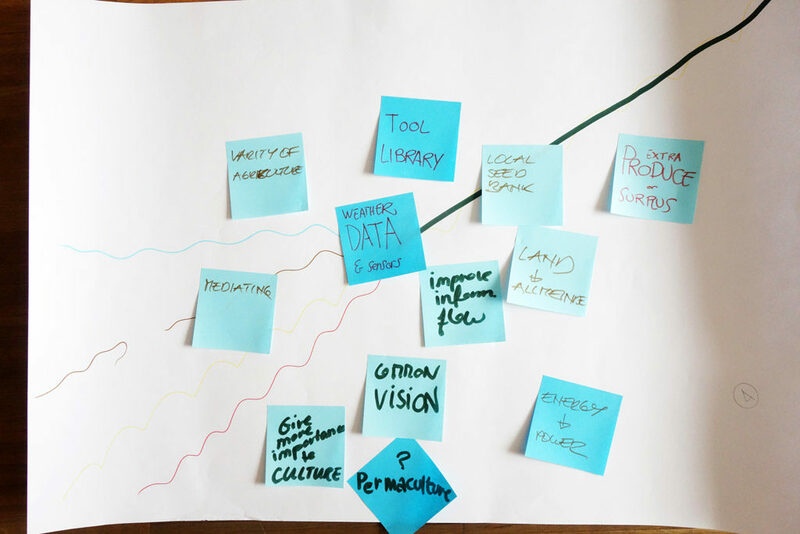 Questions of this kind were explored in our workshop in Mals – Malles, together with local farmers, representatives of social, tourism and work organisations from the territory, designers and researchers, at the Hier und Da Festival and in collaboration with By Design or By Disaster. At the beginning of spring, in an a stable of timeless architecture at the organic farm Sockerhof, in Mals – Malles, muu-baa took its first steps. Opening the Countryside! was the title of the workshop held during the festival Hier un Da Festival, the aim of which was the promotion of reflections and actions towards sustainable agriculture. 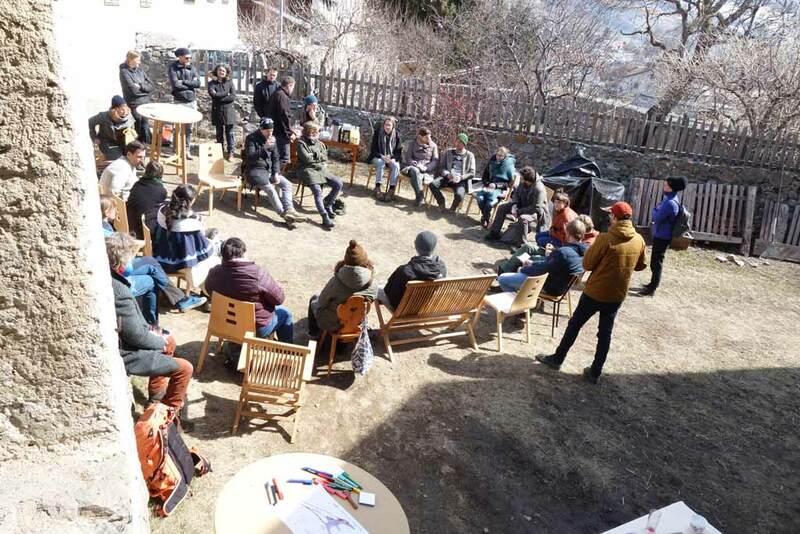 Organized locally, the festival reflected the will of inhabitants to seek alternative solutions to the intensive monoculture that has been impoverishing the Vinschgau – Val Venosta alpine valley for decades. What could a farm be? – when the muu-baa network still did not have a name and was only just beginning – together with Inland and BAU, facilitated the workshop on the logic of openness in agriculture. In the first part of the workshop, titled Open Source Agriculture, prof. Alastair Fuad-Luke and Erica Boito questioned the concept of openness and sharing from an historical perspective, proposed a selection of case studies and asked the participants to brainstorm in groups about the need of share in agriculture. The audience included young farmers, academics, journalists, representative of social and tourism organizations of the territory, researchers, students of the Master in Eco-Social Design and, in general, Hier und Da Festival goers and By Design or By Disaster 2018 conference attendees. For this exploration’s participants, sharing in Open Agriculture is mainly driven by two type of factors: economical and relational. Economical benefits concern costs, time, resources and risks sharing. Relational benefits deal with the needs of connection (humans-nature and among individuals) and transmission (of information, knowledge and capabilities). Sharing is, in any case, built on trust and, apparently, the perception of the need of sharing is amplified in conditions of scarcity of resources or incomes. In the future, farming communities might have to share labour, technologies, techniques and resources such as energy and land. They might also share a common vision, a sense of belonging and positive emotions and a living landscape – “a land landscape that is lived and cultivated”. Analysing the language used through Part 1 of the workshop, it is interesting to notice that the main two keywords are responsibility and knowledge. In part II, the project ALMA, by Inland and curated by B.A.U., was presented, including a film invoking past, present and speculative futures. The audience discussed questions that linked art practices, traditions and conflicts, in the framework of the local agriculture scenery. – There is an apparent tension between tradition and innovation as values. Most farmers are attached to tradition. This rural tradition is also attractive to urban and city dwellers. Innovation and changes require time: there is a general feeling of fear of new things and the perception of the risk involved in any change is high. – There is the need of facilitators or mediators who will help in developing urban- rural in-between projects, in supporting dialogue among the farming communities that will encourage experimentation. – The farmers’ lack of free time must be kept in consideration in the development of any intervention. In conclusion, it is important to highlight here the necessity of introducing facilitators who pursue interactions among different stakeholders and frameworks (rural-urban) and the relevance that the rural context plays as setting for the discussion about possible agri-cultural futures.